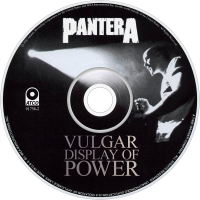 Vulgar Display of Power is the sixth studio album by American heavy metal band Pantera. It was released through Atco Records, on February 10, 1992. One of the most influential metal albums of the 1990s, Vulgar Display of Power has been described as "one of the defining albums of the groove-metal genre". Several songs from this release have become some of the band's best known, such as "Mouth for War", "This Love", and "Walk".